Reminder of this weeks Tribal Spirit Drumming with Tom Quinn in association with the Glendalough Arts Network at the Brockagh Centre this Tuesday November 13th – 7:00pm start. Contact the Brockagh Centre on 0404 45600 & leave your contact information to book a place. “This drum circle invites people to come together to celebrate community and life through rhythm and music. We use African drums such as djembe, boogeraboo, djun dujns and other instruments such as bells and shakers. We learn celebratory and healing rhythms and chants from the tribal cultures of planet earth. We work as a group to create the rhythms. 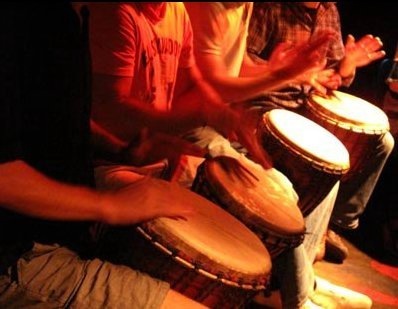 Everyone has something to offer within a drum circle. Tribal spirit Drumming offers a holistic approach to community music, at its root the use of the drum, chant, and ritual, specifically as powerful tools for healing, personal growth, and empowerment. Tribal spirit centres on the creation of space for the ingestion of healthy positive nutrition (nutrition defined as : all things that we receive into our bodies, minds and spirits, such as ; food, air, water, light, colour, sound, information, touch ). Previous PostFireside Sessions – Friday November 16th – Glendalough Green – 7:30pm startNext PostChristmas Tree Lighting Event: Sat 8th Dec, 6:00pm, Laragh.